Pyramid Peak, where we hiked last year. Fairly soon into our stay here, we bought our hiking/land use permit from the Ounalashka Corporation (the Aleuts) so that we could walk the trails on their land. We’ve used it frequently to hike up a hill right behind our boat where a bunker and gun emplacements were built during World War II. Needless to say, there are incredible views from up there, and we’ve managed to get some pretty nice shots of the bald eagles. It’s a short walk (about 20 minutes up) so we’ve done it several times, in sun, fog, and rain. We’ve been very grateful to be able to borrow Andy and Daneen’s truck while we’ve been here, not only for stowing our gear, but for exploring further afield. Last year we hiked Pyramid Peak, and this year we drove the other way to hike a trail down to Beaver Inlet, a huge deserted bay framed by mountains. The trail was just beautiful, winding through a lush valley, waterfalls cascading into it, and thousands of wildflowers underfoot. When we reached the shore at the end of the trail, I was struck by the pristine beauty of the black sand beach, crossed only by a few fox tracks. And there wasn’t a sound except for the lapping of the wavelets. Paradise! For our second big hike, we’d planned to walk partway up a multi-day trail that crosses the whole island. But when we reached the trail-head, there was no trail. But this is Alaska, so that wasn’t very surprising. We started up a nearby ridge instead, not really planning to do much more than get a view over the valley and the bay behind us. 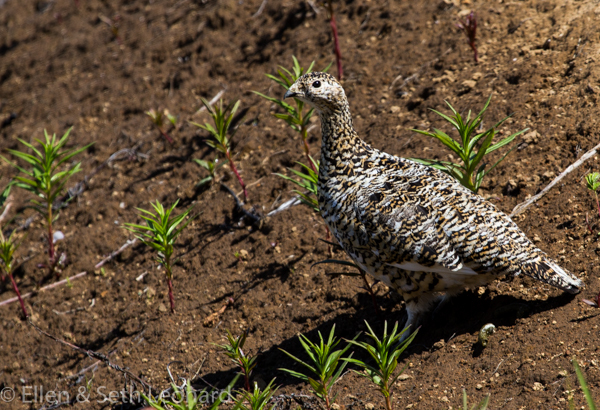 As well as the stunning view, we saw more beautiful wildflowers, some Arctic ground squirrels, and a willow ptarmigan morphing into his summer plumage but still with patches of white. Somehow we just kept climbing: the spongy tundra was easy to walk on, and it’s normal in Alaska just to hike where you want to when there are no trails. Two hours later we found ourselves scrambling up rocky cliffs to the top of the highest ridge in our vicinity. At the time we didn’t know it was the highest one because everything up there was veiled in fog. We decided it would be more fun to make a loop than hike down the way we came up, so we scrambled into a valley and crossed a big stream that became a gorge lower down. We ended up crossing five or six more of these before starting the descent to sea level, which we reached just as it was starting to rain in earnest. A great adventure! And all the better for being unexpected! Categories: Aleutian Islands, Arctic Voyage | Tags: Adventure, Aleutian Islands, Birds, Eagles, Friends, Hiking, Nature, Photography, Waterfalls, Weather, Wildlife | Permalink. The green valley looks amazing. 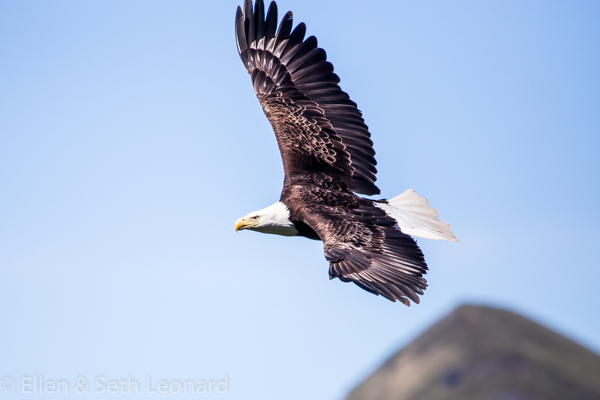 Great shot of the eagle and I would love to see a black sand beach. Seems like a trip to Alaska is in our future. Maybe once the kids leave home, until then I will enjoy your posts, thanks. You should definitely make a trip to Alaska!! So much to see – it’s turned into one of my favorite places anywhere! Glad you are enjoying the posts! 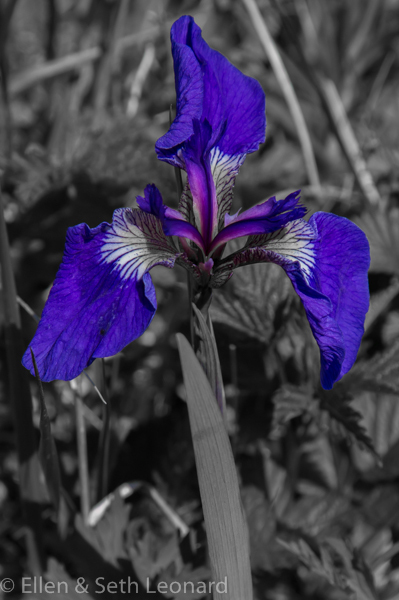 Such lovely photos you are sharing with us. The beaches are beautiful, and what a great picture of the bald eagle. You make me wanna go to Alaska (but I wasn’t too hard o convince t begin with…) Hehe… How long are you staying on Unalaska Island? The harbour looks well developed, more than I would have expected – fishing industry? 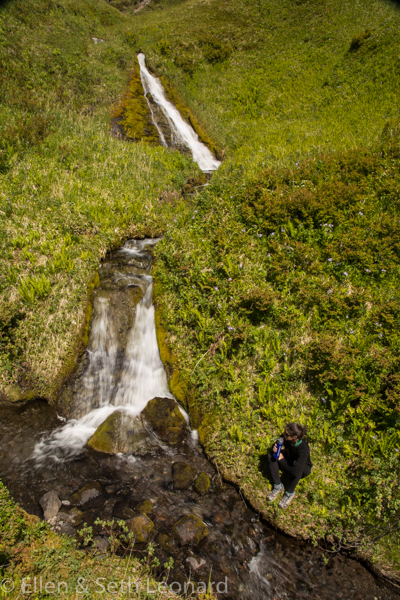 Thank you, and thanks for the Twitter follow 🙂 We actually left Unalaska on the 30th (I scheduled the posts in advance b/c Internet’s been iffy since) so we got to spend over 2 weeks there! The harbor is quite developed for a big fishing industry – all those buildings in the picture are a fish processing plant. 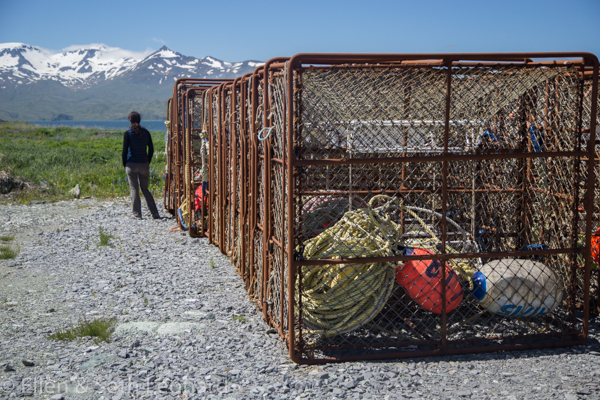 They fish for King crab (among many other things) out of there – people know it for the Deadliest Catch TV show. Feels quite remote, though, in other ways – only one road, the mail often doesn’t get in on account of weather, etc. Interesting place I’m glad to have visited! 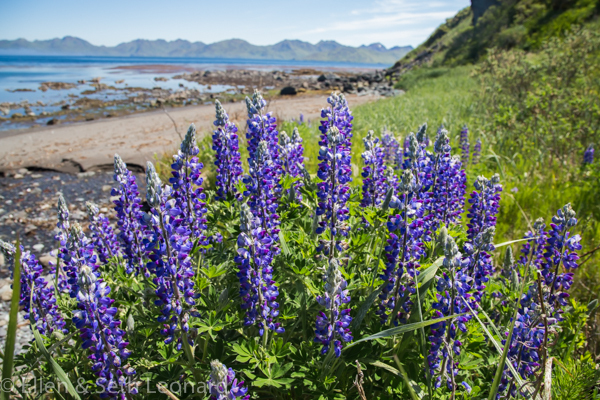 Great images – love the lupins and the details on the eagle’s wings!… Isn’t special when you go exploring ashore and get rewarded with stunning landscapes, wildlife and nature. Sure is! We had a lot of fun with them and are so grateful for their help looking after Celeste over the winter!